A hoarse voice refers to a weak or altered voice. It is a relatively common presentation, and can represent a wide range of pathologies. In this article, we shall look at the investigations and differential diagnoses to consider in a patient with a hoarse voice. Any patient presenting with a hoarse voice should undergo a flexible nasal endoscopy (FNE). FNE allows visualisation of the larynx and the vocal cords (Fig. 1), therefore key in identifying any underlying pathology. It can be performed in the outpatient clinic, with minimal preparation required. Stroboscopy is used in specialist voice clinics and can be a very useful diagnostic test in vocal cord dysfunction. It involves the use of synchronised flashing lights to make vocal fold movements appear slower, allowing for complete assessment of their movement. 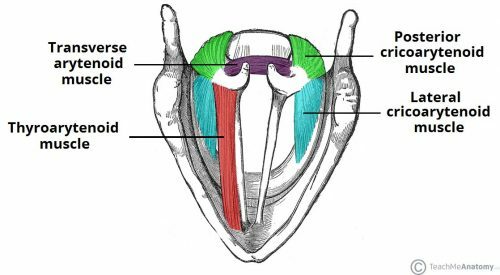 The true vocal cords are responsible for producing voice by being able to abduct and adduct, through innervation from the recurrent and superior laryngeal nerve. Any pathology affecting the structure of the vocal cords or their innervation will result in hoarseness. Figure 2 – Superior view of the intrinsic muscles of the larynx. There are a number of possible causes of hoarseness, including benign laryngeal conditions, infective, neurological, malignant, and functional. Functional causes should be seen as a diagnosis of exclusion when no cause can be found, however it is a common cause for hoarseness. They are benign lesions that are frequently bilateral (Fig. 3), occurring at the junction between the anterior and middle third of the vocal folds. Commonly present with a hoarse voice worsening towards the end of the day or following prolonged use. 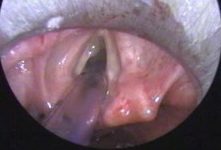 Vocal cord polyps are typically benign lesions, however unlike vocal cord nodules, they are normally unilateral and may need surgical excision to exclude malignancy. If left untreated, papillomas can grow to cause airway obstruction and hence need surgical excision or debulking. It is not uncommon for patients to need repeat procedures as papillomas can recur. Reflux laryngitis is a cause of hoarseness caused by acid reflux resulting in inflammation of the larynx. Clinical examination will often be unremarkable, but FNE will reveal an erythematous larynx. Further investigation may require an OGD and treatment will be with a PPI ± H. Pylori eradication therapy. 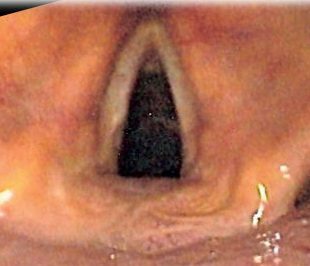 Reinke’s oedema is oedema of the vocal folds (Fig. 4). It is strongly linked to smoking in females. Smoking cessation and voice therapy are the mainstay of treatment. Clinical examination will be normal but FNE will reveal an inflamed larynx. This can be managed conservatively and should result in complete recovery. Acute epiglottitis is infection of the epiglottis, further discussed here. 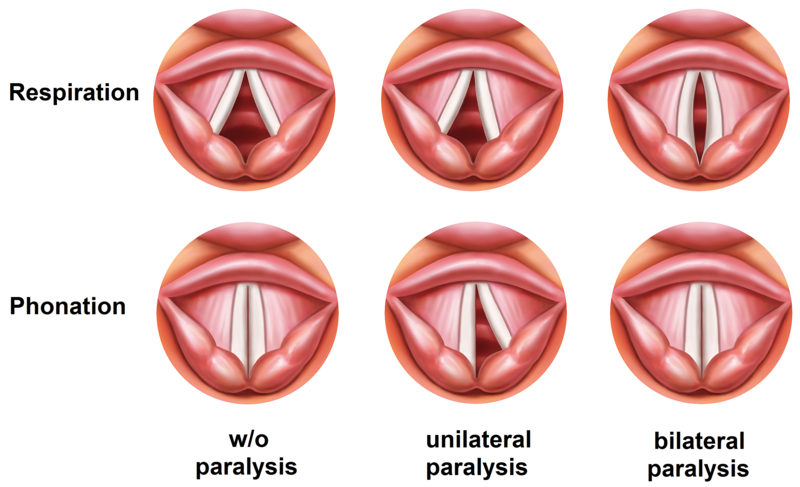 A recurrent laryngeal nerve palsy can be caused by a wide variety of underlying causes, including thyroid cancer, lung cancer, aortic aneurysm, multiple sclerosis (MS), or stroke. Extensive examinations are key to further delineating the underlying diagnosis such as neck examination and cranial nerve examination. Initial investigation if examination is unremarkable would be CT imaging from skull base to diaphragm to assess for any pathology affecting the recurrent laryngeal nerve. What is first line investigation for most cases of hoarseness? Vocal cord nodules are commonly secondary to what? Which muscle is responsible for the abduction of the vocal cords?